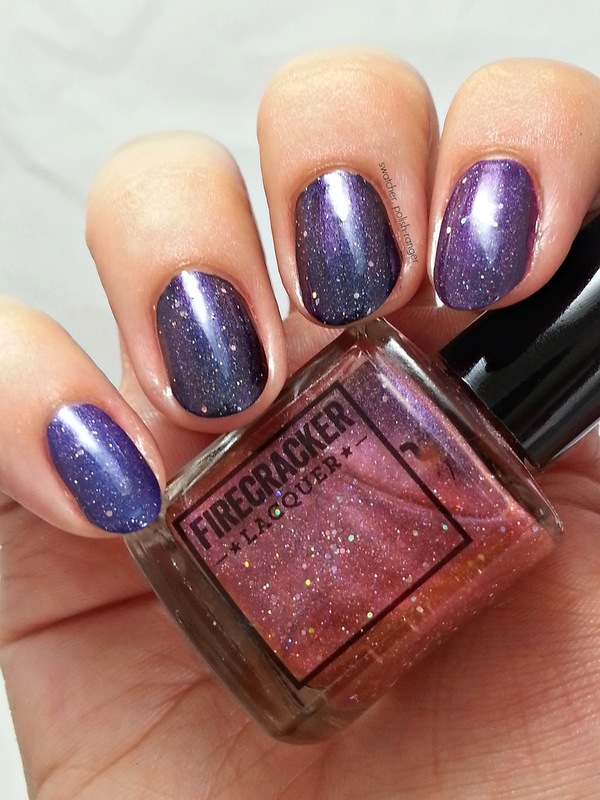 Today I'm introducing you to Firecracker Lacquer; a new brand, created by my lovely friend Kendahl, that launched their first collection on July 1st. The "Meet Your Maker" collection is intended to introduce you to Kendahl and all of the things that she loves. 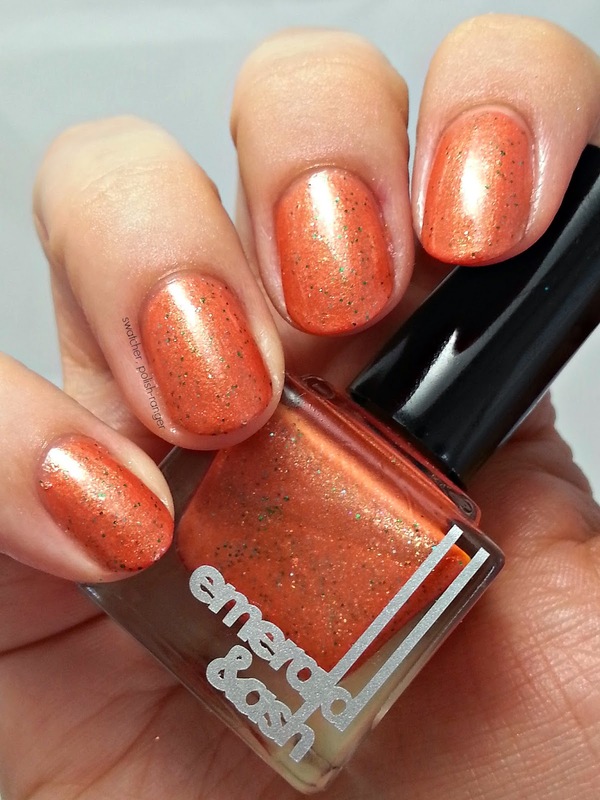 When I receive samples from a new brand I hope that they will be great (especially when they come from a friend) but I honestly never thought that one of them would end up being one of my favourite polishes ever. It's true. I kid you not. You'll have to wait until the end of the post to find out which one captured my heart. Formula wise, they were all good - they all flowed well and I didn't have any danger of flooded cuticles. 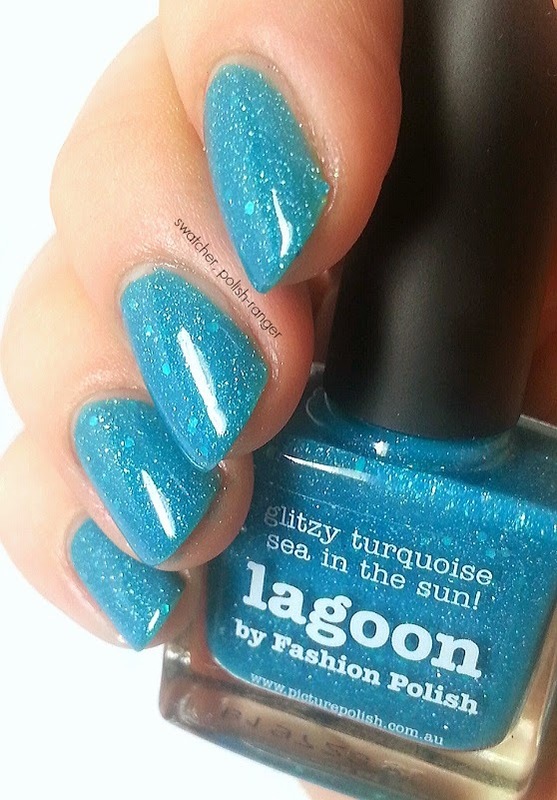 The jellies are on the sheer side and, if you are like me and don't like visible nail line, you'll need to build them up more - I used three coats for all jellies but Ocean's Deep could take anywhere from three to four coats depending on the look you want. 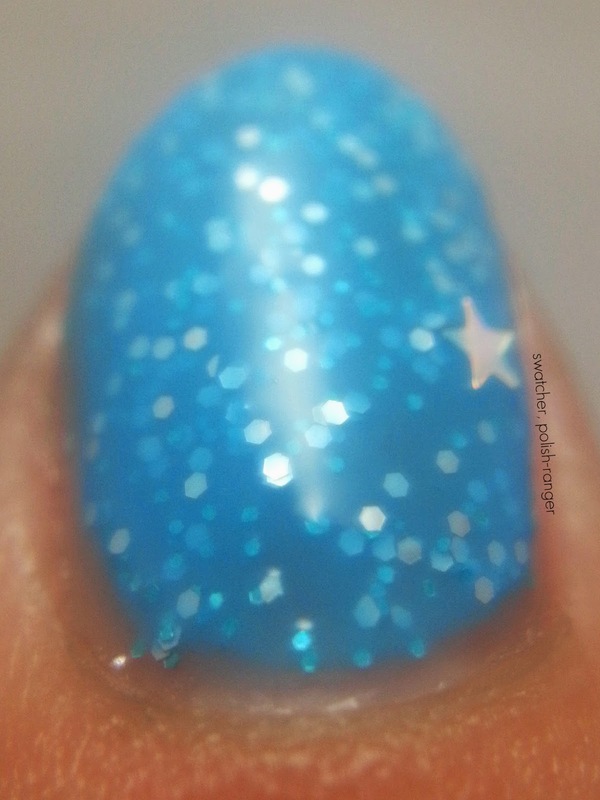 I used two coats of Frosting, Your Mom Thought I Was Big Enough, and Starry Sky but, with Starry Sky, I did have to dig a bit for the small stars. One note about my pics - I recently got a macro lens for my phone (the Easy-Macro) and I am still very much learning. polish is a tribute to a very important kid in my life, who we like to call Punk. night or day, but both at once would be awesome! better with frosting! At least, I sure think so. 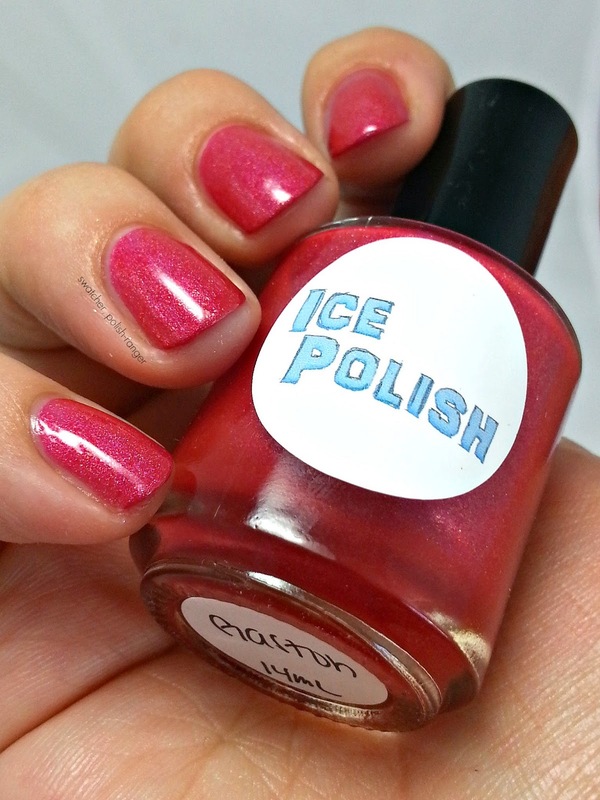 Frosting is shown over KBShimmer Low and Be Bold. [A]n homage to a planet that once was. It’s a multi-chrome polish, shifting through blue, purple, red, and orange. It’s also a linear holographic, with varying sizes of holo bits throughout as well. Great on its own but even better over black! I love space and everything in it, even former planets. Your Mom Thought I Was Big Enough is shown over blue (pinky), black (ring and middle), and purple (index). 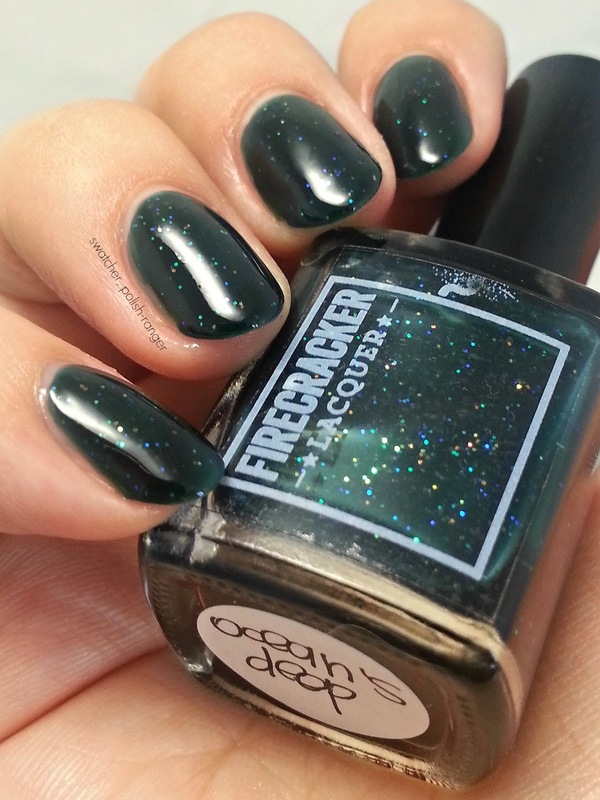 [A] blackened teal jelly with iridescent hexes. I adore the ocean and all of its gorgeous creatures, even the ones that will eat your face off. 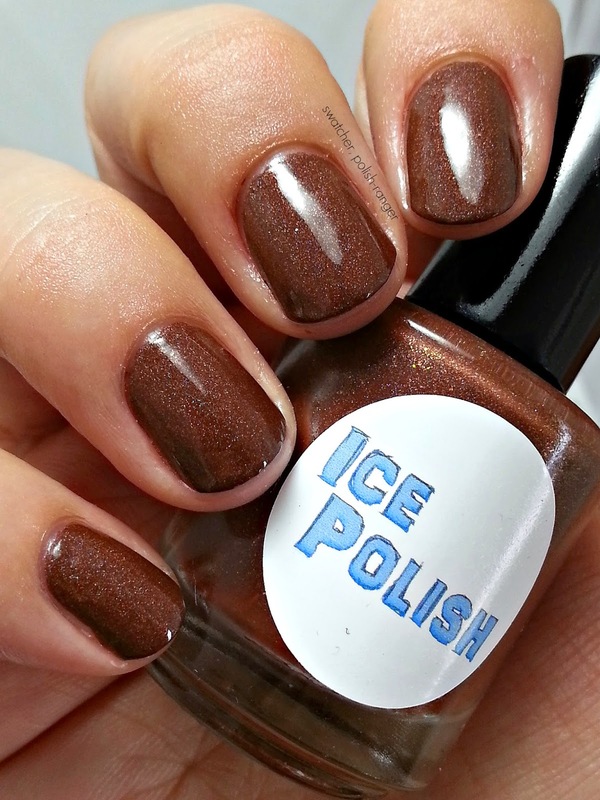 These swatches are a long time coming but I finally got my poop in a group (why is life so.... lifey?) to edit and post them. I was super excited when Erin contacted me about swatching these. The Dreams Comes True... Not If I Can Help It collection is based on Disney princesses and villains - I thought the colours she picked for the pairings were spot on and the formula for all of these was amazing. I have six colours to show you today so let's dispense with the chit chat and get right to business, shall we? Belle is a soft, creamy yellow with lovely pink and red shimmer (better seen in the second picture) that perfectly captures the essence of Belle's iconic dress and Gaston is a red holo with some gold flakes. 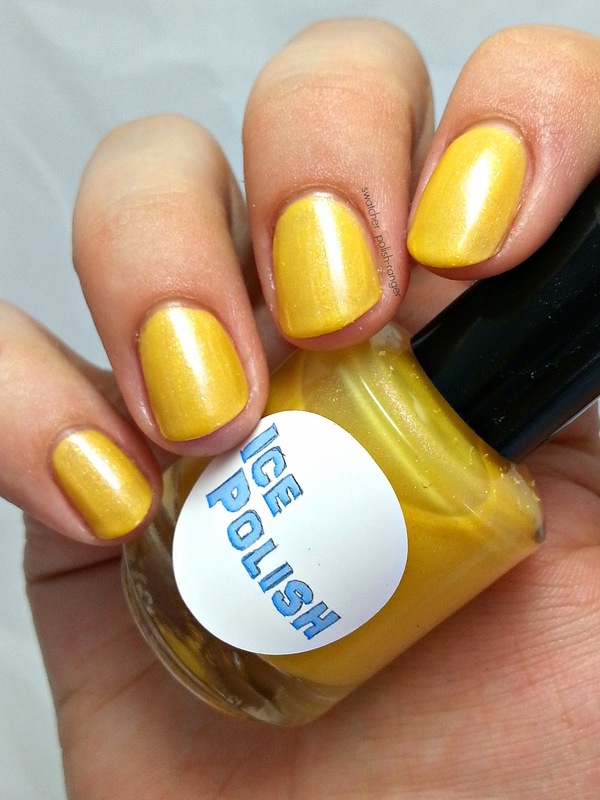 I was especially surprised by Belle considering the finicky nature of yellow polish - it had great coverage and I didn't use any white undies for these swatches. 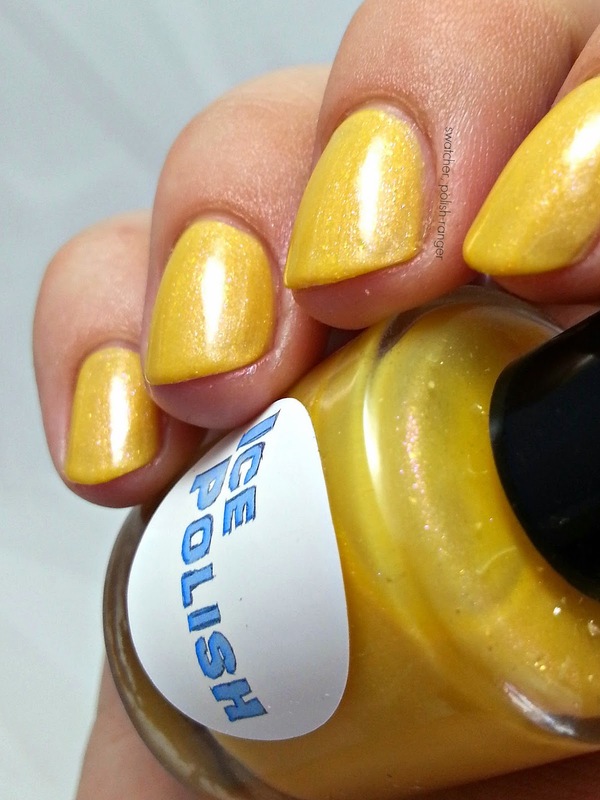 Shown here is three coats of Belle and two of Gaston, both with top coat. Jasmine is described as being a minty green but on me I think it definitely reads more as baby blue. It has a lovely holo effect and even though Erin said care needs to be taken with application to not show brush strokes, I had no issues. Shown here is three coats. Now, for my favourite of the whole collection - Jafar. 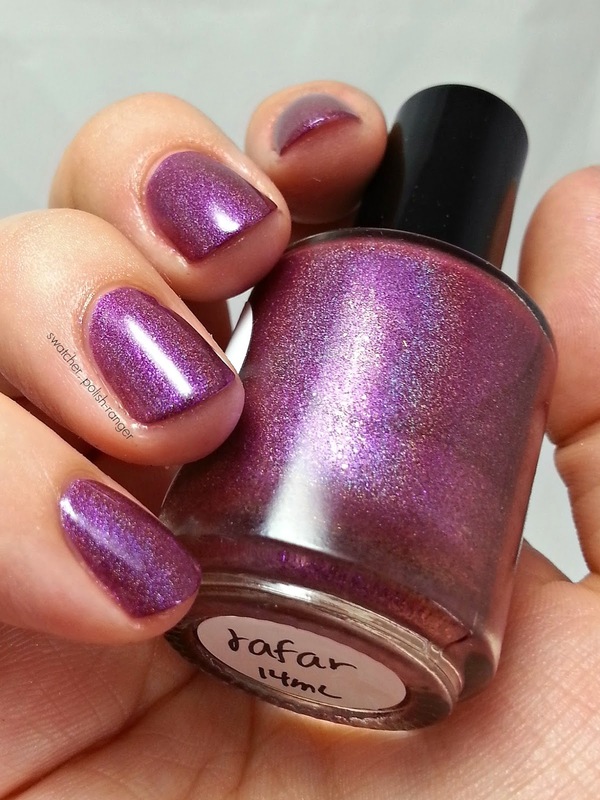 This polish completely blew me away; the plum colour is so amazing and the subtle shimmer adds life to the holo. Shown here is two coats and top coat. 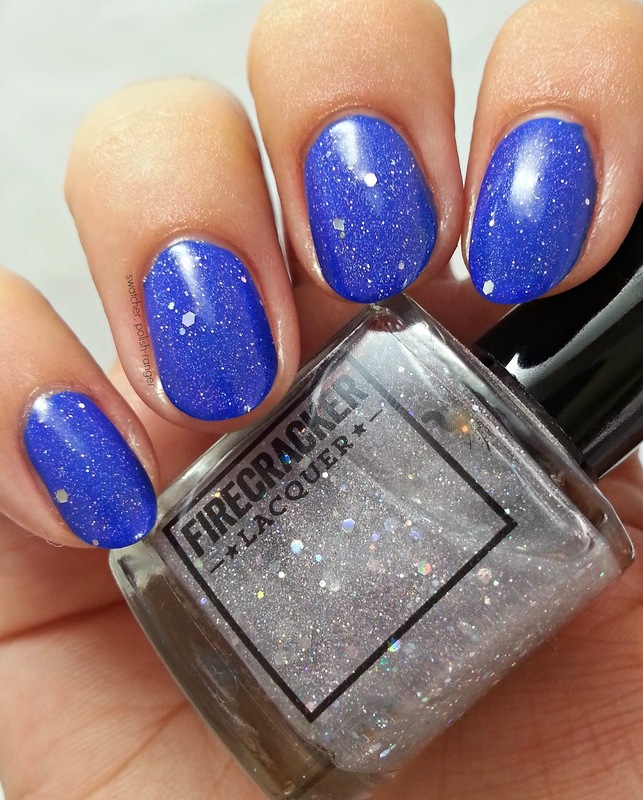 Mulan is a mid-toned, cornflower blue holo with subtle green shimmer. 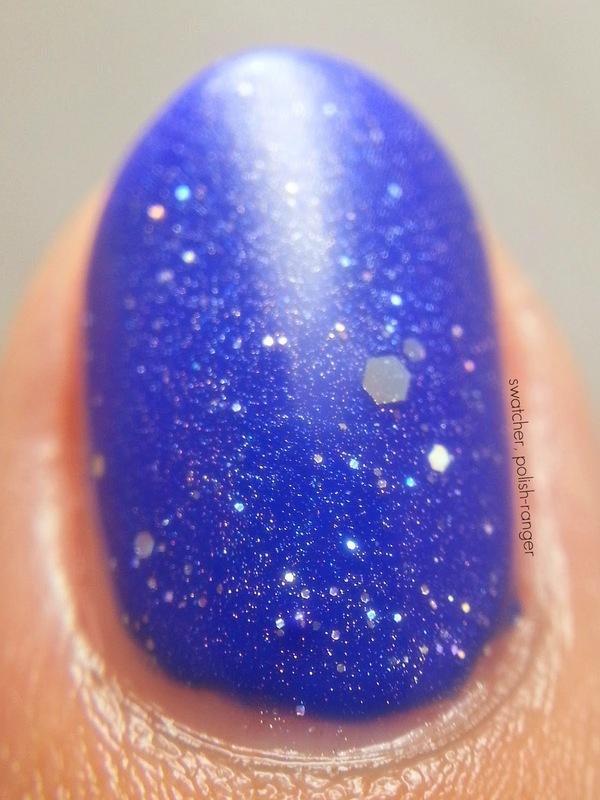 Again, the formula was great and I only had to use two coats although you can just barely see VNL. 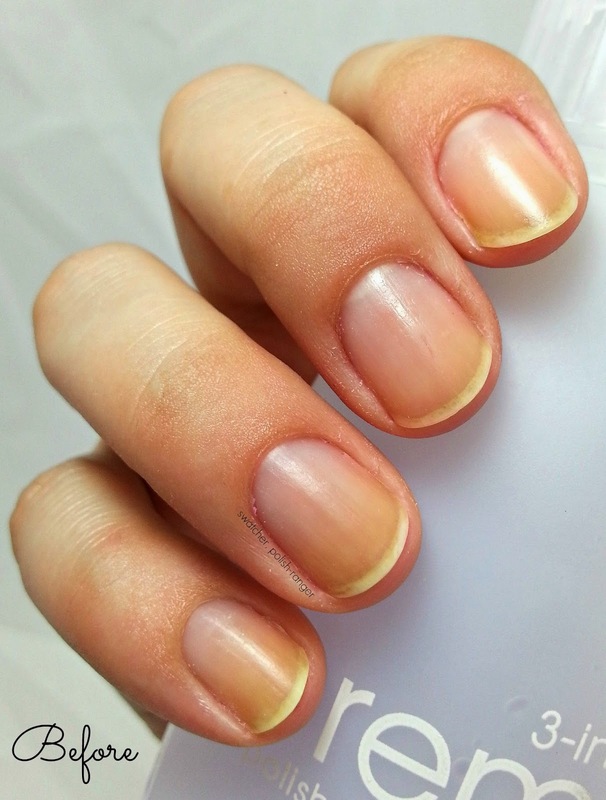 If you have longer nails you might want to consider using three coats. Shan Yu was another stand out for me. 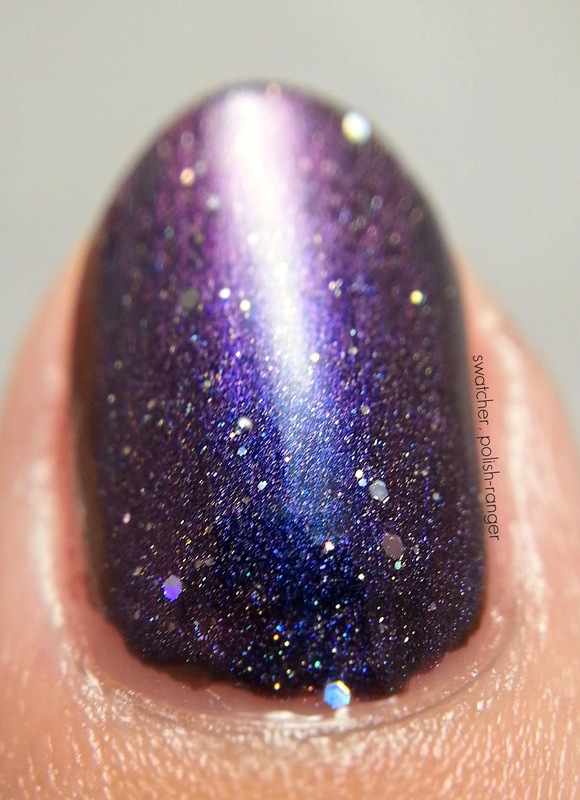 The gold flakes are seriously gorgeous and add complexity to what is still a great brown holo. Shown here is two coats and top coat. When I heard about the Great Polish Giveaway of 2014, I knew I had to participate and I knew exactly which polish I wanted to add to the prize. You can enter below. You can also enter once on each blog that adds a shade to the prize." 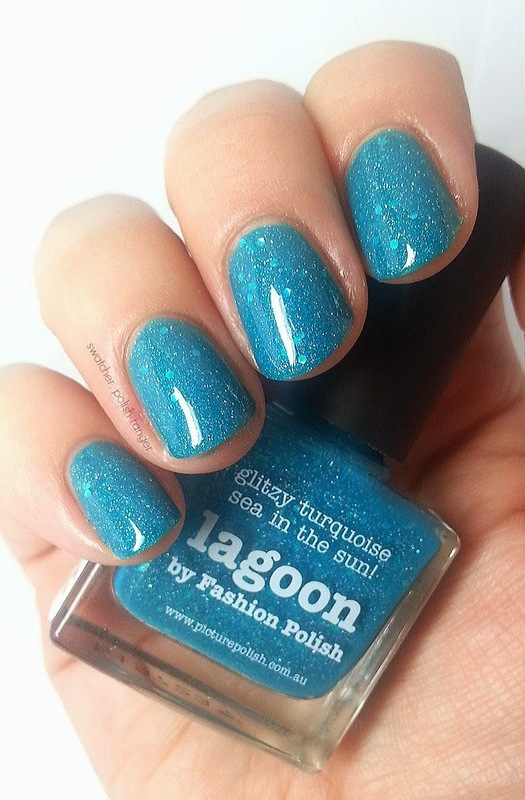 I decided to choose picture polish lagoon as my prize because I lurves it so. 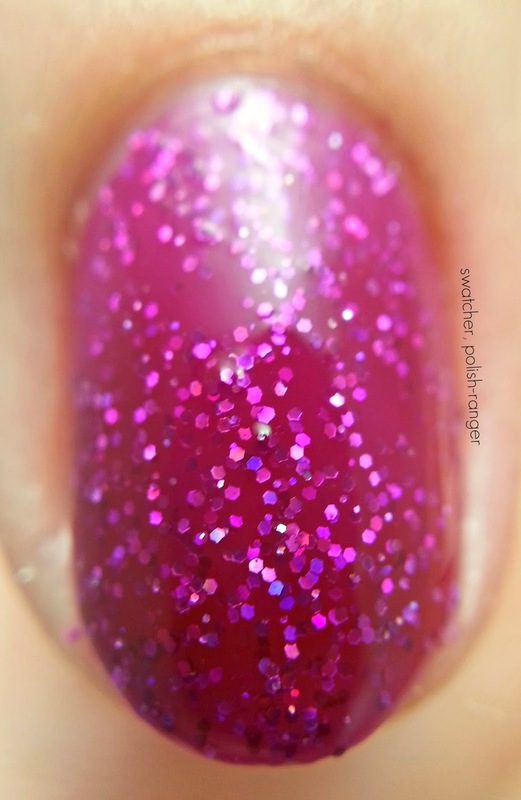 I swatched this beauty in the first month of this blog's life so here are some old swatch photos. Gorgeous, right? 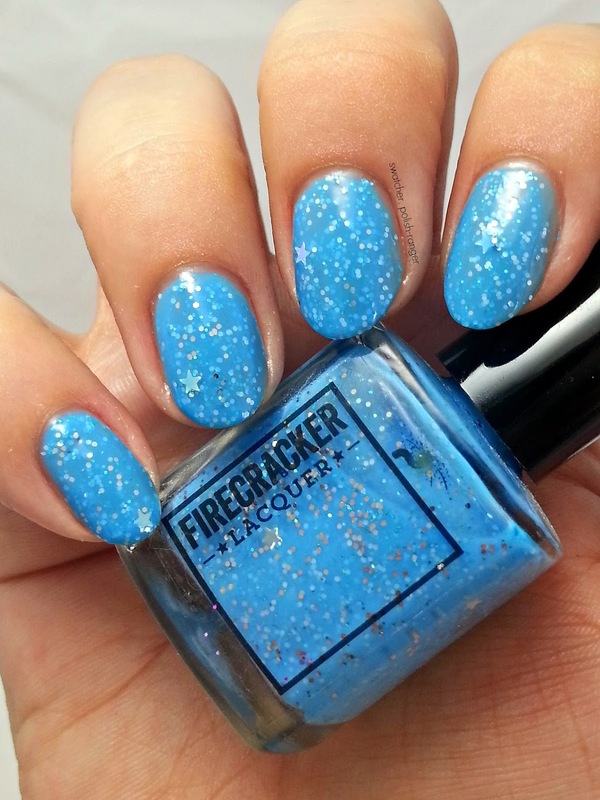 Not only is the turquoise jelly base perfection, but the simplicity of the glitter really makes this a stunner. 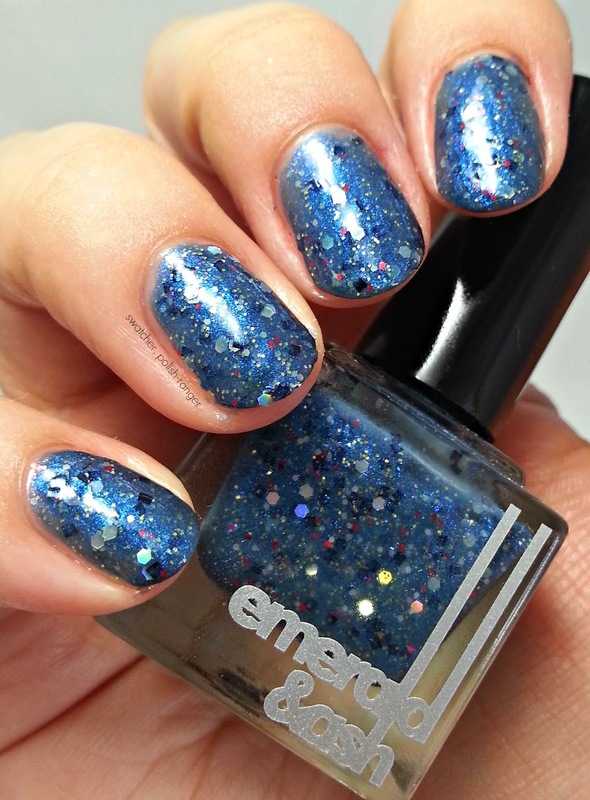 So, you want to win up to 200 bottles of nail polish (and who wouldn't)? Enter below! And if you have a blog of your own, go fill out the nomination form and add to that haul! 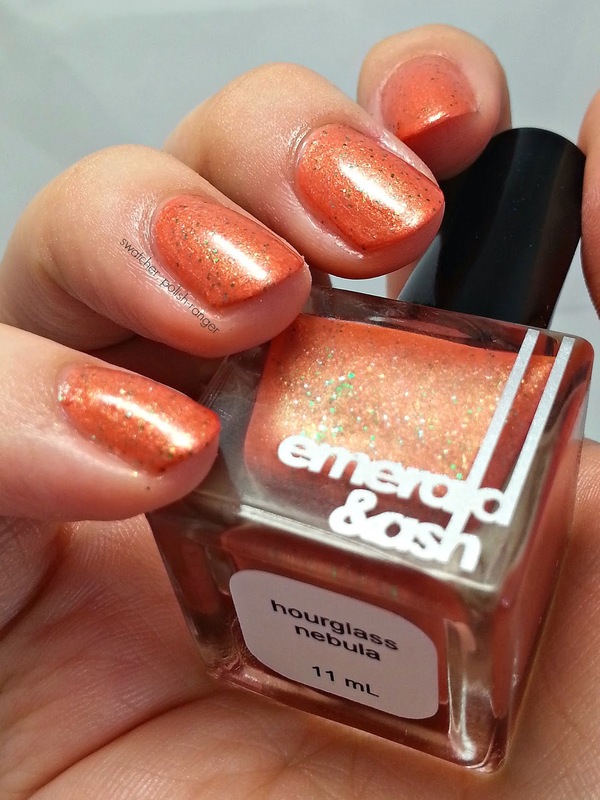 Emerald & Ash Nail Oil, Hourglass Nebula, Dark Matter, and a FLASH GIVEAWAY!!! Longest post title ever? Mayhaps but it's for a good reason. 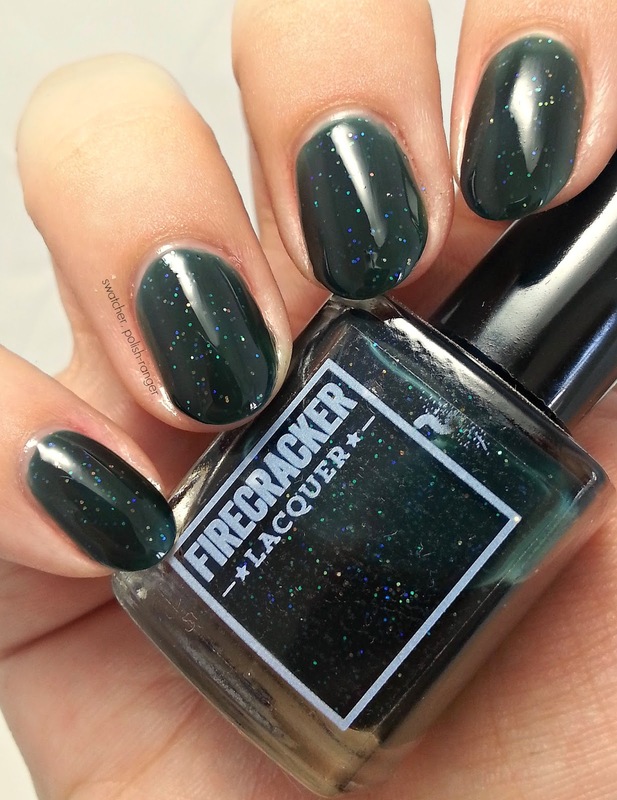 You see, Emerald & Ash is launching a new collection tomorrow and, in addition to the new pretties, there are a few being discontinued. Alllllso, I will be reviewing the E&A nail oils in this post and Ashley and Nate offered up some gift cards so that people could try out their stuff. So, do you see where I am going with this now? What better time to have a flash giveaway then right before the launch of a new collection?! My blogger pack hasn't arrived yet (pesky border) so I will include some links to other reviews of the new stuff and I'm going to show you two of the beauties being discontinued. Hopefully this will give you a pretty good idea of what you want to snag tomorrow. 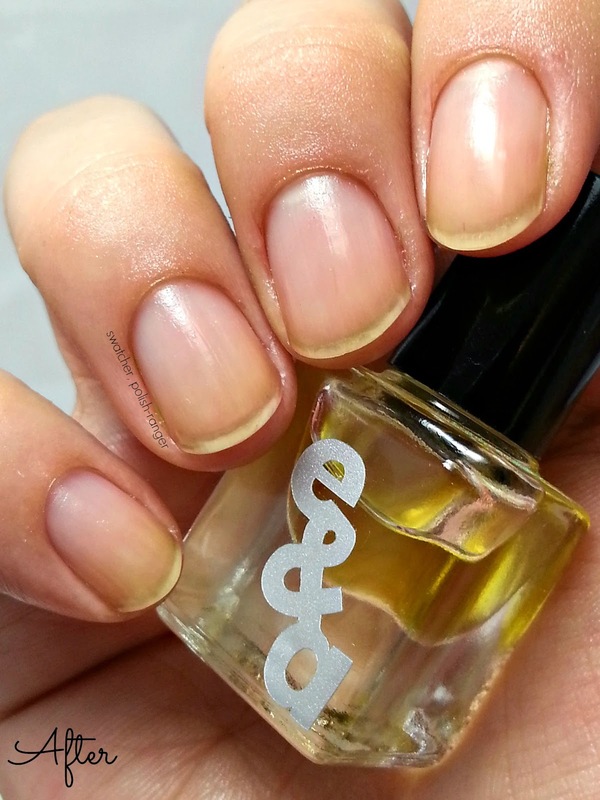 First, the nail oil review. I'm going to put out a disclaimer right now and say that if you are looking for a balanced review of this stuff, you'll have to look elsewhere. 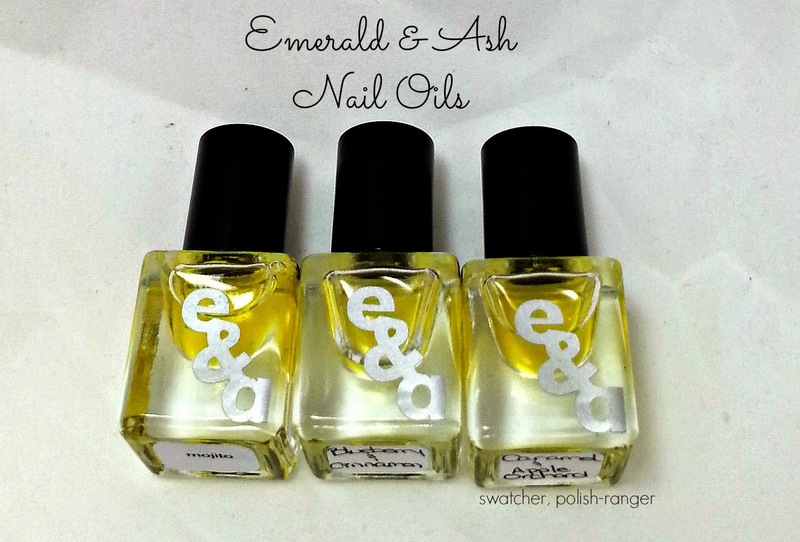 I literally do not have a bad word to say about the Emerald & Ash nail oil. Not only is the blend unique and fast absorbing, the scents are plentiful and there are very, very few that I don't like. I've tried so many of them, in blends and alone, that I've created a spreadsheet to keep track of them all. Hopefully my notes will be helpful in deciding which scents to try. Our nail oils are hand blended and mixed to order. None of our oils sit with scents premixed into them. We use a unique blend of oils that include Fractionated coconut oil, grapeseed oil, jojoba oil, meadowfoam seed oil, tea tree oil, vitamin A oil and vitamin E oil. We offer 85 scents in both essential oils and fragrance oils. Those 85 scents can also be blended into an even larger selection of scents. Along with that we offer unscented, sellers choice where we choose the scent and a scent of the month that is offered at a discounted price. Safe to say, I love these oils. I have bottles spread everywhere - in the car, my purse, bedside table, at work, etc. - and use them several times a day because I am a serial cuticle picker. My cuticles aren't just dry, they are damaged. Pretty horrible for a nail blogger, right? You would think that swatching multiple polishes in one sitting would make my cuticles worse but, because I apply some E&A oil after removing each polish, my cuticles generally look BETTER after a swatch-a-thon. Do your hands a favour and grab some now!! My favourite way to purchase is the 4ml three-pack because then I can try three different scents for minimal cost. You can't beat $6.50 for 12ml of oil!! 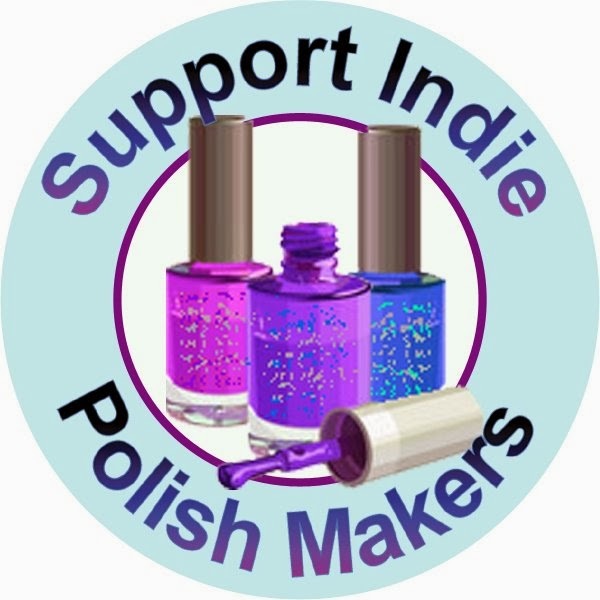 Now, on to the two polishes being discontinued. Both are from the Hubble collection and both are unique and lovely. 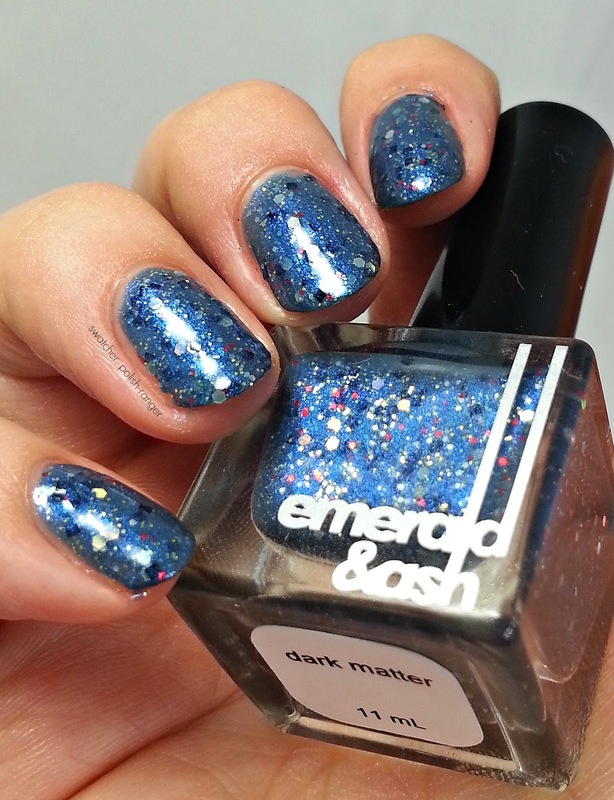 I used two coats of polish for both Hourglass Nebula and Dark Matter. I love all of the polishes in the Hubble collection and these two are no exception. Finally, the giveaway. This is truly a FLASH giveaway. The new collection launches at 9am Mountain time, tomorrow, Thursday, July 10th, 2014 and I am leaving the Rafflecopter open until 8am Mountain time, which gives me one hour to verify entries and get the winners' information to Ashley & Nate. Good luck!! 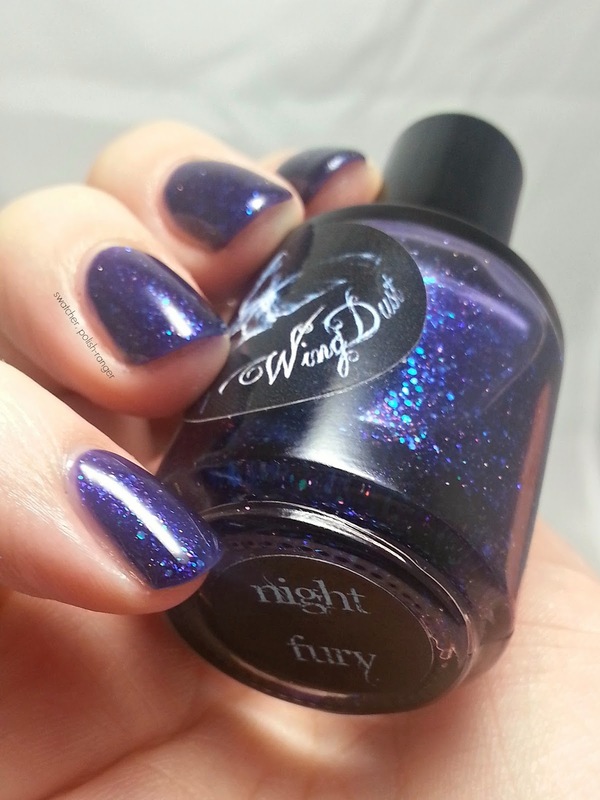 Today I'm showing you the very first WingDust I ever bought, Night Fury. 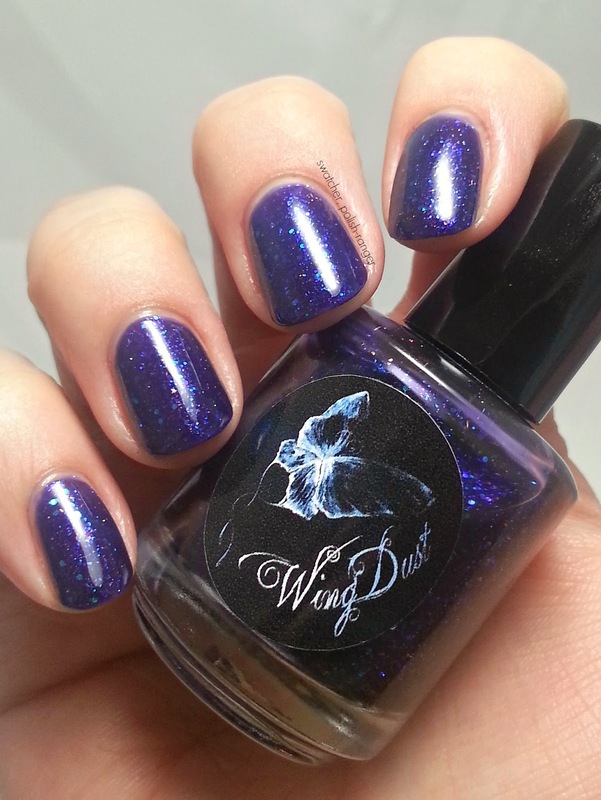 Not only is it a totally gorgeous polish, but my daughter was obsessed with How To Train Your Dragon when I first came across WingDust. Now, with the second installation recently being released, I thought it was perfect timing. Plus, who doesn't love Toothless? He's just the most adorable dragon ever. 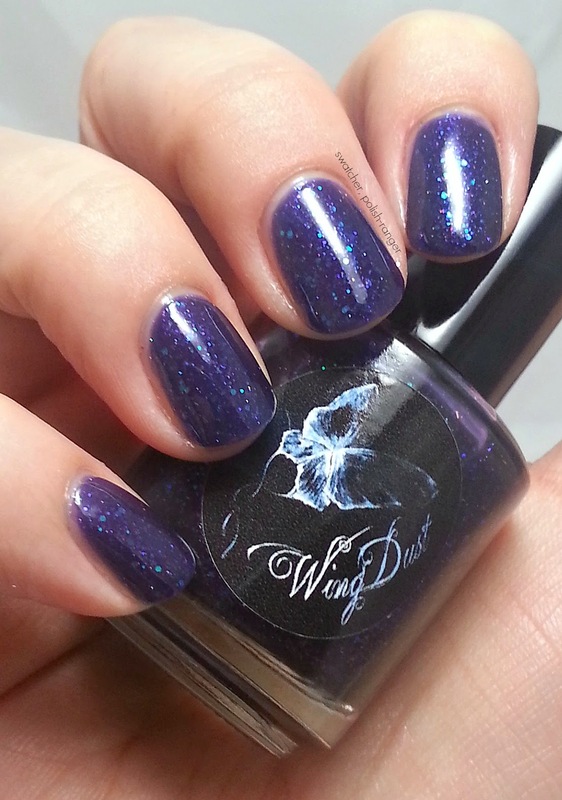 Night Fury is a "deep purple/blue jelly polish loaded with blue and purple iridescent glitters and shimmers" and has such depth and sparkle. My pictures seriously do not do this polish justice. 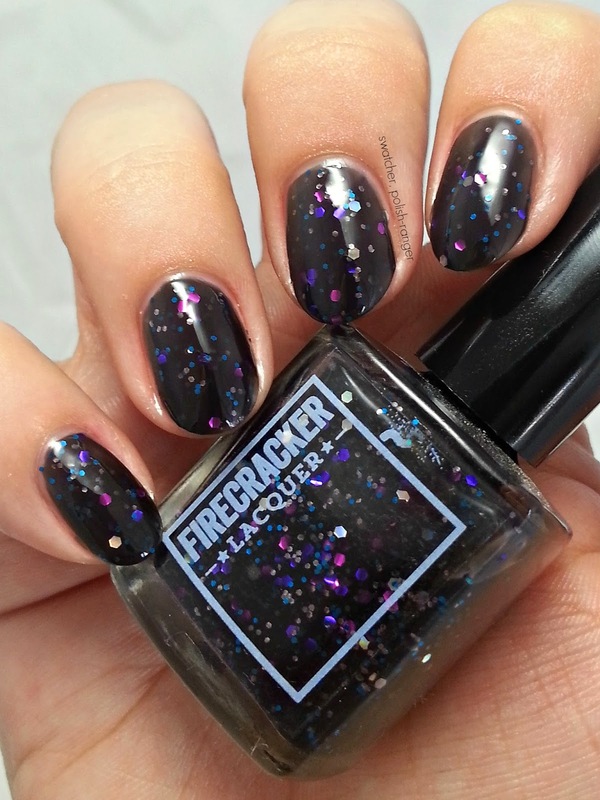 Shown here is three coats of Night Fury (I like the extra sparkle) and one coat of HK Girl top coat.